We present a systematic study of corrections to scaling in the self-organized critical forest-fire model. The analysis of the steady-state condition for the density of trees allows us to pinpoint the presence of these corrections, which take the form of subdominant exponents modifying the standard finite-size scaling form. Applying an extended version of the moment analysis technique, we find the scaling region of the model and compute nontrivial corrections to scaling. Pastor-Satorras, R., Vespignani, A. Corrections to scaling in the forest-fire model. 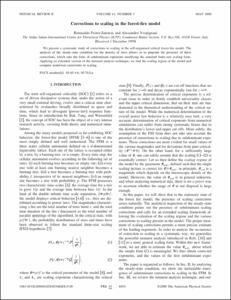 "Physical review E: statistical, nonlinear, and soft matter physics", Maig 2000, vol. 61, núm. 5, p. 4854-4859.